I know this is true for me and millions of others who need music in all aspects of their lives. Are you the type of music lover who commutes playing your tunes, relaxes with great music, and even goes to bed at night with a little musical accompaniment? 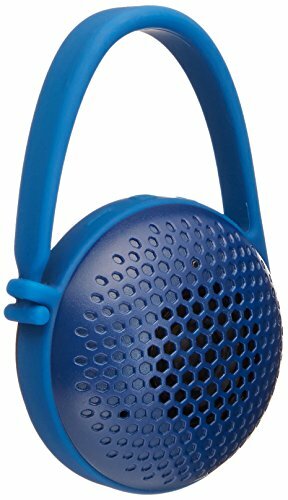 Then, why not take your music to the next level and purchase a top rated Bluetooth shower speaker? Bluetooth shower speakers utilize the excellent acoustics that are available in your shower, so you can grove while you soap up. 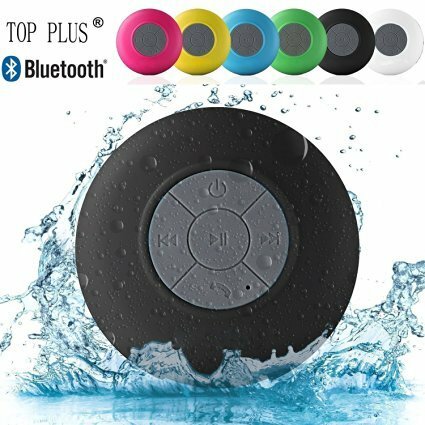 Bluetooth shower speakers are an easy way to connect up your favorite Smartphone, tablet, or mp3 player and listen via the airwaves to apps like Spotify, Pandora, or Google Play Music. Obviously, these devices are fully waterproof, and for the most part, most models pipe great sounding music through a single speaker. These shower speakers my not be for everyone as some are more contempory looking than others. With that said, you should always aim to buy quality. One thing can be said for sure, is that these shower speakers have made it to our top ten and are what we consider to be as best on the market and top rated. 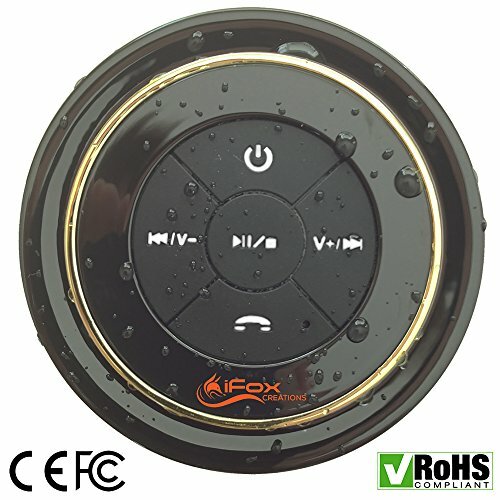 This is an excellent shower speaker that combines excellent sound quality with smart design. Aesthetically, it resembles a blue-colored eyeball, without looking strange in your shower. The bulb shaped speaker loops easily around your shower head or wherever in your shower that you can make it fit. As a matter of fact, this device can even be taken with you outside of your shower, since the loop can easily be placed on a bag or in a car. When it comes to sound quality, this speaker produces some great sounds that reverberate well with the acoustics of a shower. In addition to this, Super Smart also included some impressive bass boost in this speaker, which is rare for these types of devices. Hookup is easy, simply connect to the device via your Smartphone and enjoy. AquaAudio’s Cubo has some great design that allows it to easily be one of the best Bluetooth speakers on the market today. The first suction cup device on our list, you simply press this device to your shower wall or door and wirelessly tether via the Bluetooth connection. 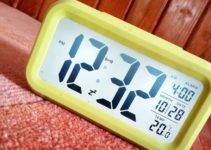 Amazingly, this wireless device is guaranteed to keep a charge through ten hours of continuous usage. From a looks perspective, this Bluetooth speaker is very uniquely designed. The main console area is relatively square-like with larger buttons on the front, so that volume control, track skipping, and playing is always in reach. Amazon Basics’s Nano is the latest in the e-commerce giant’s efforts at making affordable products that are convenient. As a handled device, you can simply hang this speaker wherever you want the most sound. Its splash-resistant design is perfect for any venue that will get wet and wild like a shower. Since this is a handled type, you won’t have to worry about the accidental falls that can happen with a device that uses a suction cup. With this speaker, you can expect about six hours of usage before you’ll have to recharge via the included micro-USB cable. In addition to its speaker functionality, this device also features a built-in mic for taking calls. Our fourth entry has a very simple design that’s made to be intuitive and quick to operate. The deep cavity design of the speaker delivers a crisp full spectrum of sound. Sometimes, the best Bluetooth speakers can have a more simple design, and this is a perfect example of that functional simplicity. 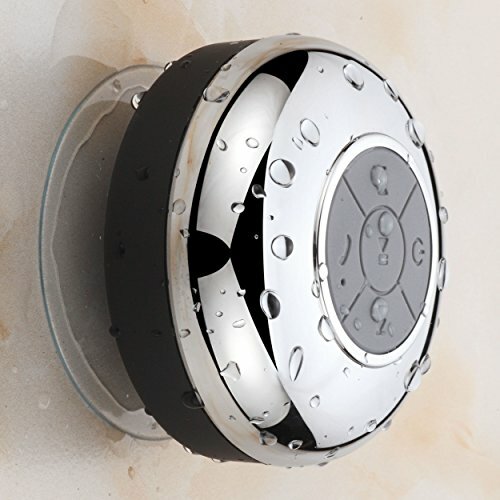 To attach this shower speaker, you simply press the suction cup base onto a smooth shower surface. The NeeGo Wireless Speaker can also be paired with your other Bluetooth Devices, great for anywhere, not just the shower. This model of Bluetooth shower speaker has some truly quality sound generation capabilities. This is because it boasts a passive subwoofer and 40 mm drivers, which allow for some truly bodacious sound. It also has a great design with a ribbed outer surface that also helps reduce the stress of impact. 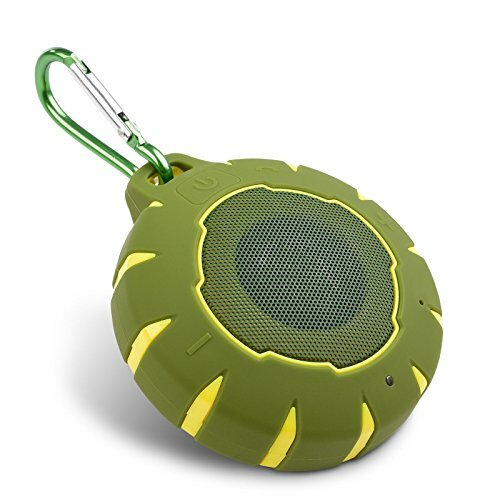 This is a hanging type of shower speaker, and iXCC provides a carabiner clip for hanging it from surfaces. 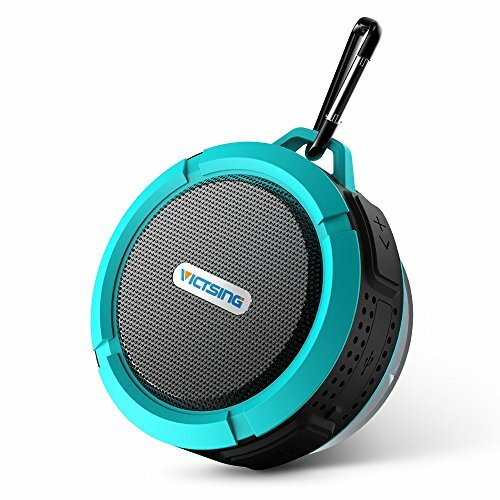 If your shower head is too thick, it’s relatively easy to find another surface that this waterproof speaker can dangle from.In addition to these features, this speaker also has a built in mic for calls and is easily used outside of the shower, via the carabiner. 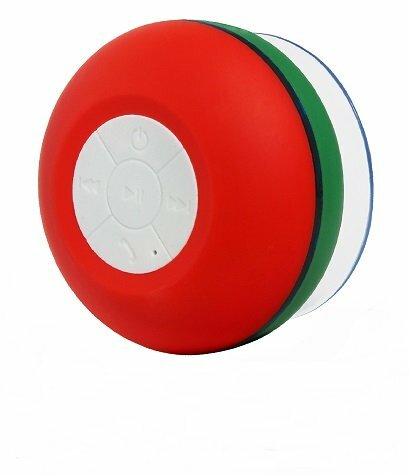 This fully submersible Bluetooth shower speaker has a very unique, stepped design. As another suction type, this speaker is surrounded by a wide bumper, so that falls will barely affect the device. Its suction is strong, so you’ll not have to worry about it disconnecting much anyway. 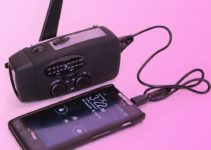 When it comes to maintaining a charge, this is one of the more longer-lasting devices on this list; on a full battery, you can expect ten hours of continuous playtime. A great feature of this device is its LED indicator that lets you know when the device is powered on. Like many other devices of this type, you’ll also be able to make wireless calls from your shower. HotelSpa is the perfect manufacturer for this device because its chrome outer shell makes it look at home in a posh hotel. This aesthetic feature makes it very unique amongst the best Bluetooth shower speakers, and when it comes to functionality, this device also has great merits. It has a 20 foot reception range, and also includes a wireless mic for calling from the shower. It doesn’t have a massive battery; you’ll only get about three hours of continuous playtime on a full charge. The sound quality is very clear, so that while you relax in the tub, you’ll easily be able to let the music take you away. This Bluetooth shower speaker has a bit of the best of both worlds. First, it includes a carabiner clip, so that you can hang it anywhere in your bathroom with ease. In addition to this, it also has a full-fledged suction cup, so if you don’t have an easy way to hang it, you can simply stick it to your wall. The controls for this device are fairly unique; you control your entire playback options through the buttons aligned along the side of the speaker. Its speaker is also quite powerful for its size; a full five watts, with plenty of bass support for very good shower sound. 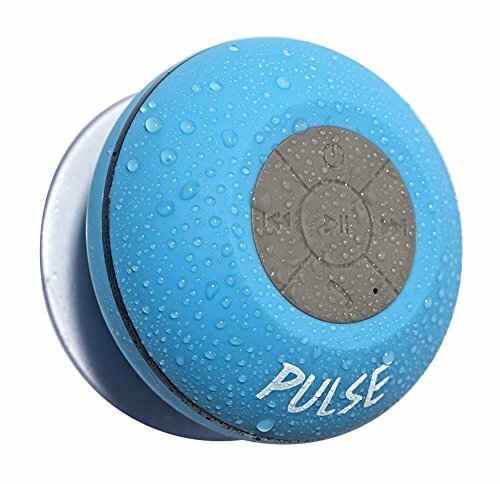 The Pulse Bluetooth speaker is one of the more popular devices on the market. Its 4.0 Bluetooth connectivity is also fairly rare among its competitors. The pulse’s claim to fame is that it has a very simplified design that will produce high quality sound, without a whole lot of complicated functionality. This speaker contains a powerful subwoofer for great bass and even has a LED around its sides that provides a light show as your music plays. This is a suction-style model that provides a very good level of suction on most surfaces. The outer edges are also designed to absorb the shock of most sudden falls. Our final product on this best Bluetooth speakers list is the Exkokoro shower speaker. Like the previous entry, this device uses LEDs to provide a bit of a light show to accompany your music. This experience is fun and entertaining to watch as you are washing up. This is also a suction cup model, so you’ll need to stick it to a flat surface before you take your shower. Since sound is very important on a speaker of this type, Exkokoro utilized an inner magnetic horn for sound that guarantees a high bass effect for lows and a pitched effect for the mids and the highs. There is even a dedicated call button, so that you can utilize the built-in mic to communicate from the shower if need be. Before you go out and get a new model Bluetooth shower speaker, let’s take a look at some pre-purchase considerations that you should think about. Let’s face it; the shower isn’t the safest place for electronics. Since many of these speakers use suction cups to adhere to your shower walls, you may hear a loud thud from time to time when the suction gives out. How durable your shower speaker is will greatly affect whether or not you’ll have to purchase another one. Look for speakers that have a soft, shock-absorbing case, so that it’ll last a catastrophe or two. Isn’t it always the way that people call you when you’re in the shower? The best Bluetooth shower speakers have Bluetooth calling, so that you can take your calls wirelessly and hands-free. Type: Hanging Style or Suction Cup? Typically, there are two choices when it comes to these types of speakers. One allows you to hook the speaker on your shower head and play your music from above. The other type allows you to suction to your shower’s wall or door and listen to your music that way. It comes down to personal preference, but the second variety does tend to end up in the tub more often than not. 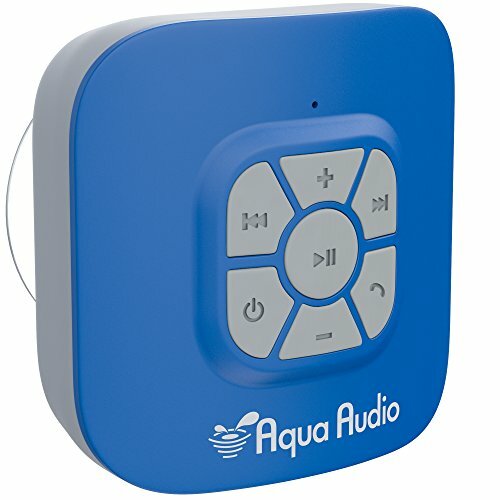 No one wants to fiddle too much with their shower speaker in order to listen to their favorite tracks on Spotify, so a speaker with a simplified interface is very useful for bathers. Simple, touch-based controls tend to be the best bet with these devices. You don’t need to spend a fortune on expensive speakers for your computer when there’s some awesome computers speakers under $50, that sound almost as good as the ones that are double in price!